DETOX, ALKALISING, CLEANSING FORMULA: Formula contains highest quality organic supergreens that alkalise the body and help eliminate toxins. SUPPORTS ENERGY, METABOLISM AND IMMUNE SYSTEM: Formula contains unique seaweeds from the depth of Atlantic Ocean, rich in iodine in an ideal food safe natural form. Most western diets lack in Iodine. Iodine is essential for energy yielding metabolism, healthy weight loss, normal immune and thyroid function. Normal thyroid function is key to the overall wellbeing. HEALTHY SKIN, HAIR AND DIGESTION: Seaweed, spirulina, chlorella, artichoke are fundamental in protecting the gut lining and gut flora, preventing leaky gut issues. Formula helps digestion, reduces bloating and supports healthy skin, hair and nails. 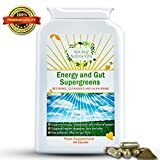 CONVENIENT AND EASY TO TAKE: One of the main complaints with seaweed and supergreens supplements is their taste, hence we have developed a formula in capsules easy to take and swallow. Easy to take with you anywhere. 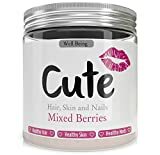 NO BINDERS, FILLERS AND SWEETNERS OR ANY ARTIFICIAL INGRIDIENTS: Only ultra-pure organic natural ingredients.